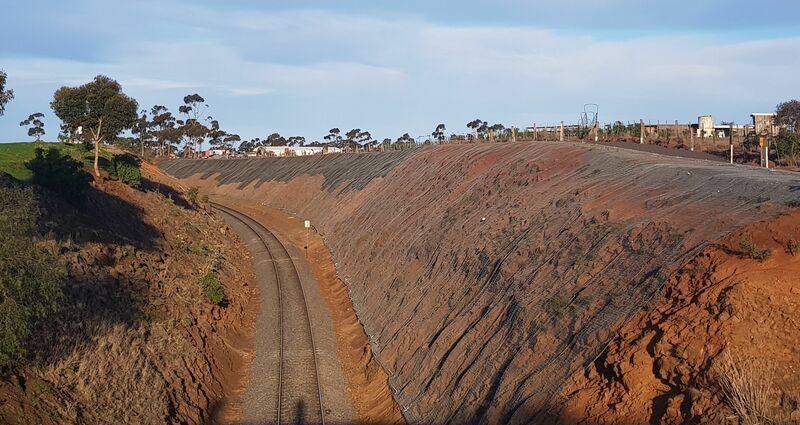 Along the Ballarat line in Parwan, Victoria, V-Line required a robust solution for 340 m of the rail cutting to stop rockfalls collecting in the cess drain. Rockfalls observed on site were generally small (<0.3 m3) but with the weaker material at the base of the cutting, the potential for overhangs to develop was high. 1. Competent columnar jointed basalt overlying pillow basalt/hyaloclastite – section is approximately 7 m high by 150 m long at an average slope angle of 50 degrees. 2. Basaltic and alluvial derived clays overlying competent columnar basalt – section is approximately 7 m high by 100 m long at an average slope angle of 50 degrees. The crest also required a new 0.50 m high bund which was installed to control drainage. 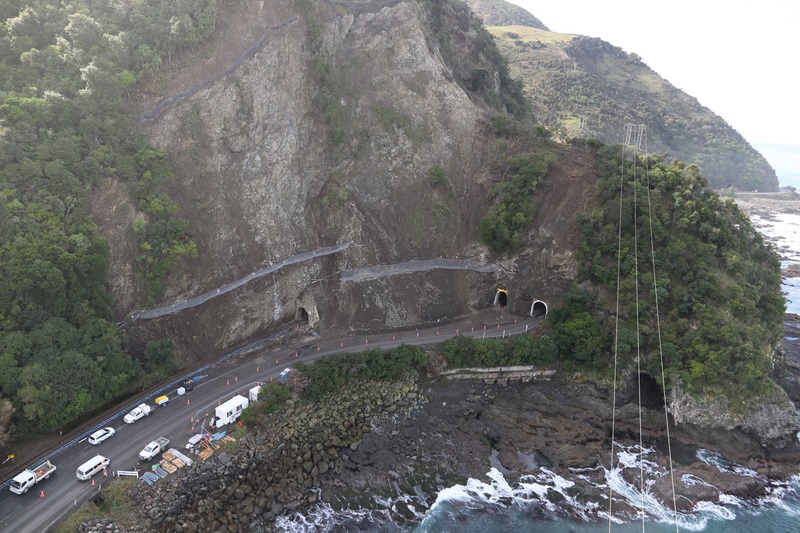 GHD contacted Geofabrics and requested specialist input to aid with selecting a suitable rockfall mitigation solution. Geofabrics provided rockfall mesh drapery design proposals utilising the MACRO design software suite. Standard details, drawings and installation information were provided. Due to the nature of the weaker and dispersive hyaloclastite and clays - Steelgrid rockfall mesh with a permanent erosion control blanket underneath was specified for certain locations. Steelgrid was selected for its high stiffness, high tensile strength at low strain and high punch resistance with low deformation. The patented mesh is an engineered combination of Double Twist steel wire mesh and high tensile (1770 N/mm2) wire ropes in a single, easy to install product. The presence of the steel cables woven within the mesh during manufacturing enables better stress distribution in the upper longitudinal cables and reduced strain in the drapery system. The 7,250 m2 of Steelgrid MO300L mesh was installed by Coleman Rail using rope access techniques. Anchors were installed at the crest and toe of the slope. The mesh hangs as a ‘curtain’ (drapery) in front of the slope and guides detached rocks to the toe. The mesh self-weight attenuates the energy of the loose surface material by reducing the bounce and velocity of the blocks. V-Line were very happy with the result and Coleman Rail were able to complete the works during the two shutdowns on time and within budget.